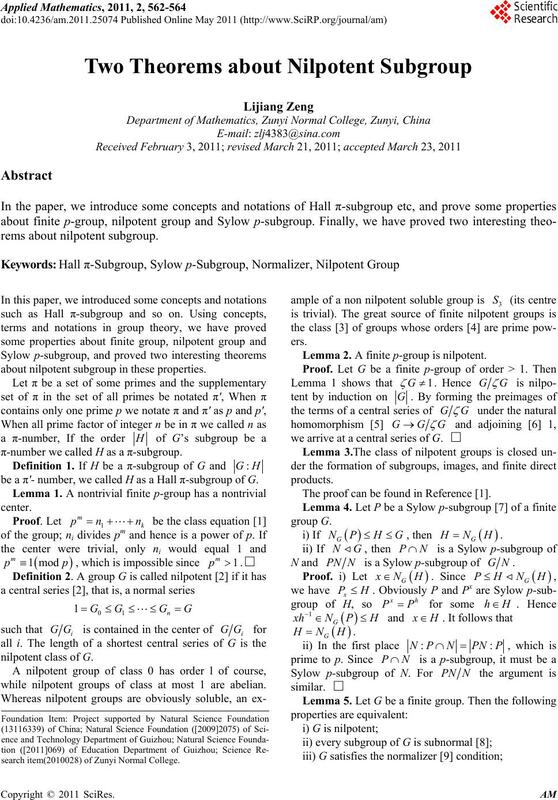 about nilpotent subgroup in these properties. π-number we called H as a π-subgroup. be a π'- number, we called H as a Hall π-subgroup of G.
, which is impossible since . while nilpotent groups of class at most 1 are abelian. Lemma 2. A finite p-group is nilpotent. we arrive at a central series of G.
The proof can be found in Reference . N and PNN is a Sylow p-subgroup of GN. search item(2010028) of Zunyi Normal College. v) G is the direct product of its Sylow subgroups. and H is subnormal in G in c steps. G; however this contradicts Lemma 4.
groups is clearly direct and it must equal G.
v)→i) by Lemma 2 and Lemma 3.
nilpotent, it follows that i; also the since . mal in G and is evidently also a Sylow p-subgroup of G.
2,3 -subgroups and they are certainly not conjugate. π-subgroups of G are conjugate. , which can be assumed greater than l.
contained in a conjugate of H and is therefore nilpotent. 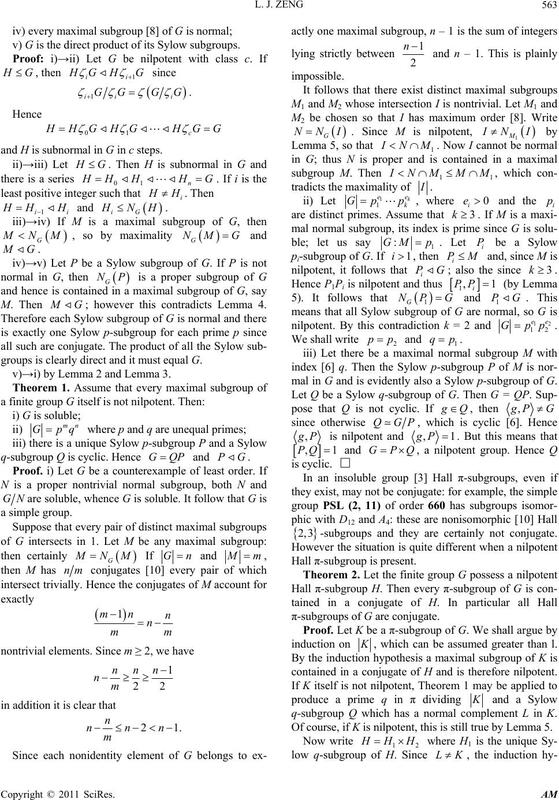 q-subgroup Q which has a normal complement L in K.
Of course, if K is nilpotent, this is still true by Lemma 5. Theory,” Wiley, New York, 1981, pp. 177-184.
sses,” Mathematische Zeitschrift, Vol. 90, No. 5, 1965, pp. LH because L is a q'-group. No. 68, Princeton University Press, Princeton, 1971, pp. matics, Vol. 51, No. 5, 2008, pp. 827- 841. 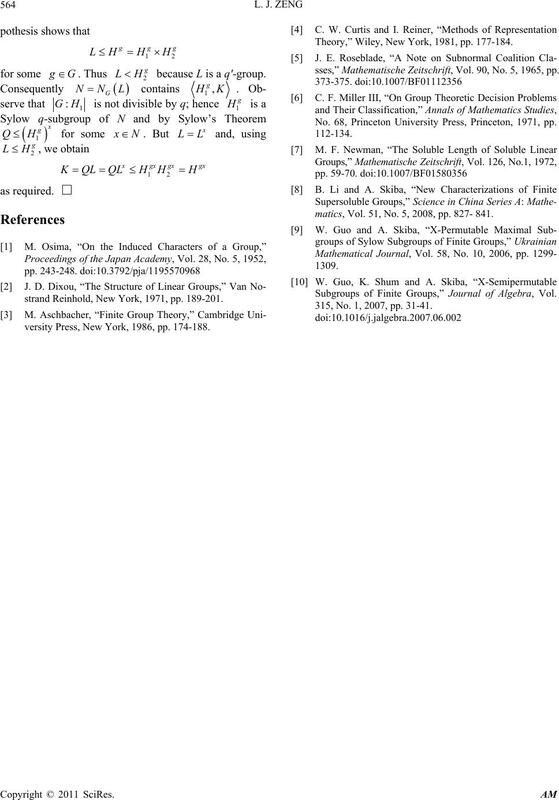 Subgroups of Finite Groups,” Journal of Algebra, Vol. 315, No. 1, 2007, pp. 31-41.
strand Reinhold, New York, 1971, pp. 189-201.
versity Press, New York, 1986, pp. 174-188.